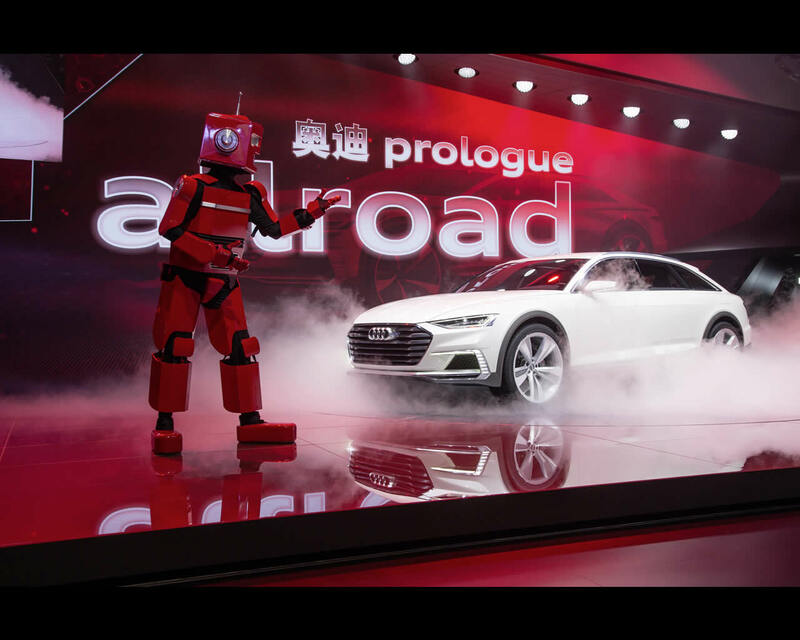 Ingolstadt, April 16, 2015 – High-end technology and unrestricted everyday practicality, plus alluring elegance: The Audi prologue allroad made its world premiere at Auto Shanghai. 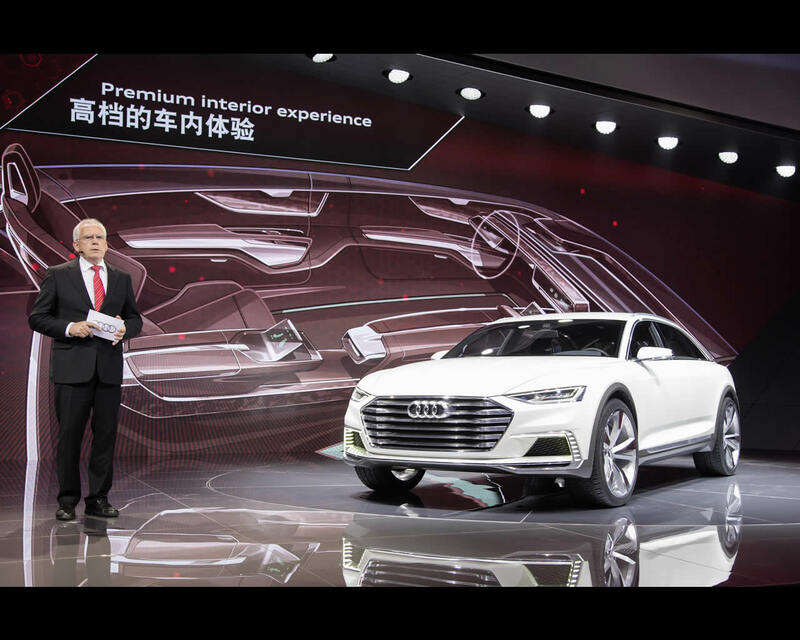 The five-door show car with its raised body and tougher stance provides a new emphasis in the conceptual Audi prologue family. Its operating concept enables digital interaction between driver and passengers; the plug-in hybrid drive impresses with 734 PS, yet low consumption. 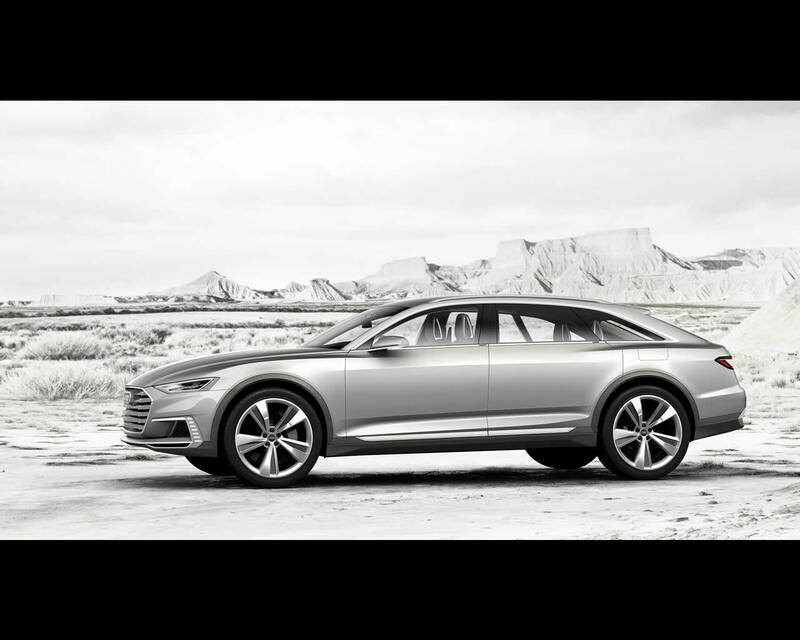 Like all allroad models from Audi, the Audi prologue allroad makes no compromises. 15 years ago, a new class of automobile debuted with the Audi allroad quattro: a car combining the comfort and dynamics of the luxury class with maximum variability and masterful off-road capability. 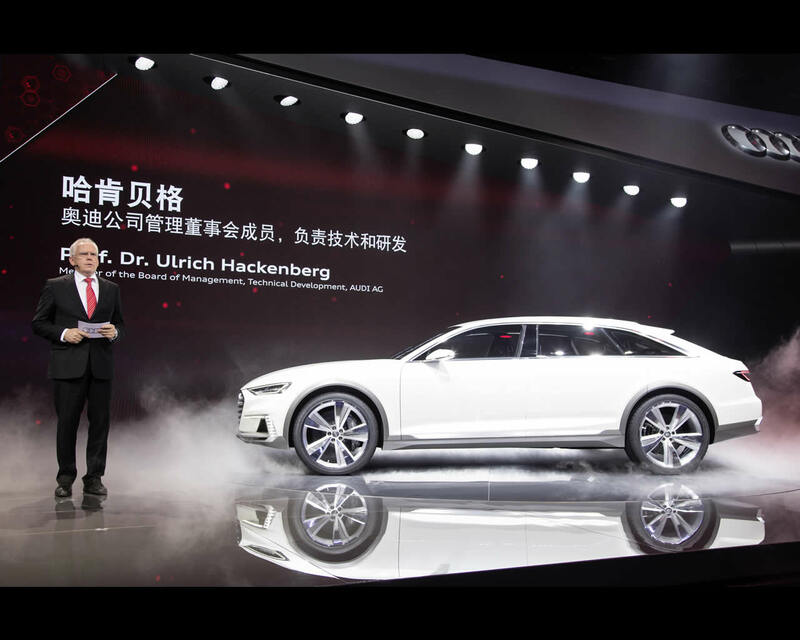 Audi is now presenting a study in China that reflects a fresh interpretation of the typical allroad themes, providing a clear glimpse into the brand’s design future. The design of the Audi allroad prologue accentuates the elegance and uniqueness of the allroad concept. Viewed from the side, the 5.13 metre Audi prologue allroad displays the new, dynamic interpretation of the Audi allroad philosophy. A long front-end, a roofline that quickly begins to drop again and extremely flat D-pillars give it an athletic profile and emphasise the elegance and dynamics of the allroad concept in a fresh way. 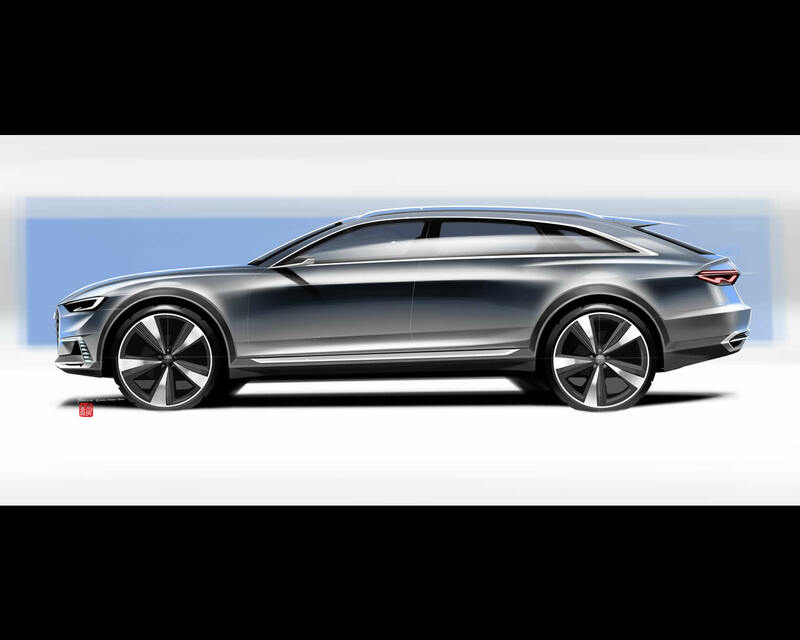 The prominent bumpers and the widely flared wheel wells, which house 22‑inch wheels with a five-arm design, make the all-around talents of the Audi prologue allroad abundantly clear at the very first glance. The proportions emphasise the front and rear wheel equally. The show car, finished in Dehua White, is a stage for progressive elegance in every detail. The window capping strips include sensor surfaces for the door locks; the covers for the charging port and fuel tank are also electric. Aluminium accents are present on the roof rails, the mirror housings, the area around the windows and both the front and rear of the car. An extension offset in grey runs along the wheel wheels and the entire bottom edge of the raised body. It expresses the power and robustness of the car and makes it seem even wider. A flat and wide Singleframe grille dominates the front. It is flushly integrated into the body. With their cohesive appearance, its brushed aluminium crossbars create a new variant of the Audi e-tron look. The show car’s wedge-shaped headlights feature Matrix laser technology, an innovation that further extends the Audi lead in lighting technology. The light is broken down into countless tiny pixels, and the possibilities for distributing this light are virtually boundless. 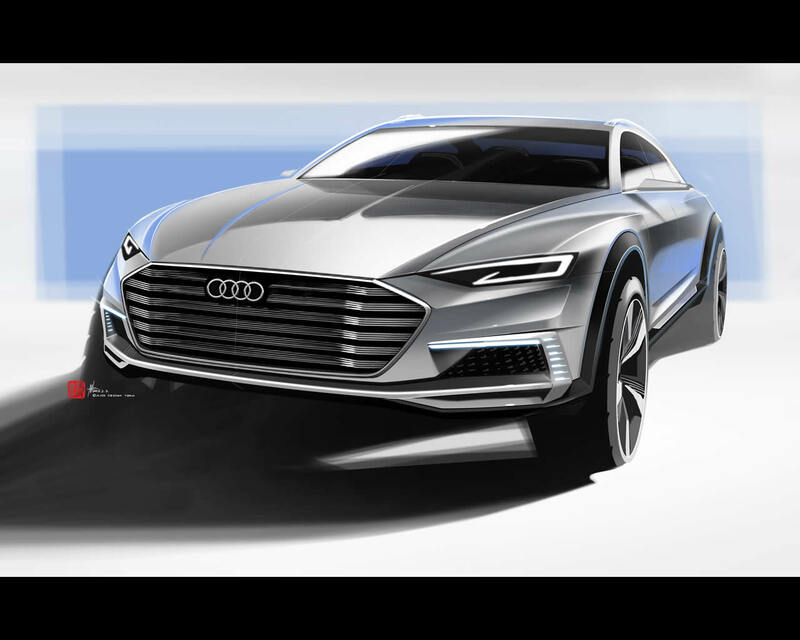 LED light guides sketch a new e-tron light signature at the upper and outer edges of the air inlets, which are bisected by the bumper blade. 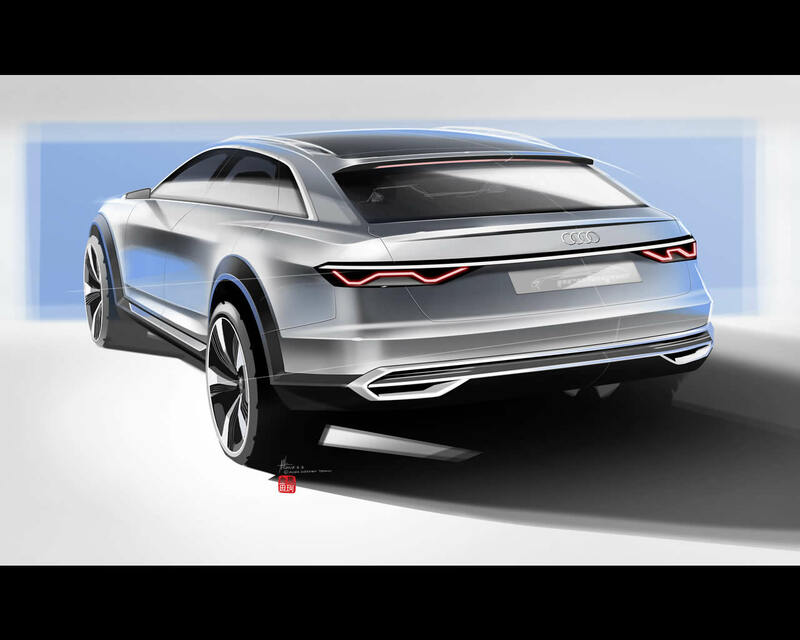 The rear of the Audi prologue allroad is strongly drawn-in laterally and as with a yacht is tilted in the direction of travel, giving the show car a dynamic appearance even when standing still. A narrow strip of lights connects the LED rear lights. Their housings are made of 3D glass producing three-dimensional, sculpted effects. The rear apron includes flat, horizontally split openings on both sides that graphically integrate the exhaust system into the rear-end design. This detail symbolises the drive concept of the Audi prologue allroad – the efficient interplay of combustion engine and electric motor. With its elegant and highly variable interior, the Audi prologue allroad is the perfect car for everyday driving and recreation. Driver and passengers experience the spacious interior of the show car as a luxurious lounge. Graceful lines and slender geometric bodies convey the impression of expanse, serenity and lightness. The continuous centre console and the front seats appear to float. The instrument panel features a strictly horizontal orientation. Its upper level is part of the wraparound – the arc encircling the cabin and the luggage compartment. A perforated trim panel covers the broad air vent; it retracts as soon as the air-conditioning is set higher. 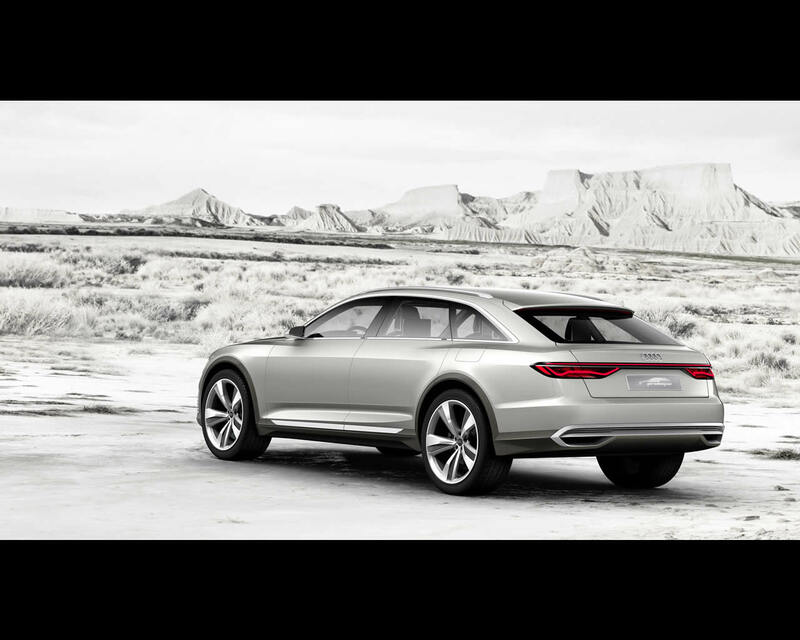 The interior architecture of the Audi prologue allroad merges with a groundbreaking new display and operating concept. Across its full width, the front of the instrument panel is designed to be a display surface which integrates three touch displays. Aluminium frames surround the driver displays to the right and left of the steering wheel. The front passenger can configure infotainment options using a widescreen display fully integrated into the instrument panel. He or she can swipe to send these to the right driver display or to the Audi virtual cockpit future behind the steering wheel. The centre console tunnel houses an additional driver display for climate control system, infotainment and text input. Featuring innovative OLED technology with an extremely thin, flexible film, it displays brilliant, high-contrast images. When inactive, the display is in a flat retracted position; as soon as the car is started, it moves up at an angle. The brand with the four rings is also breaking new ground with the Audi virtual cockpit future, which lies in the driver’s field of view. High-resolution displays and three semi-transparent mirrors generate a virtual visual stage with three levels. Thanks to this staggered approach, information is structured better and is easier to grasp. Rear passengers in the Audi prologue allroad sit in individual seats. They use an additional OLED display on the centre console to adjust the seats, the climate control system and the infotainment for their area or to exchange data with the driver. When the audio system is switched on, a sound spoiler moves out of the rear wheelhouse panelings, homogeneously distributing music in the interior in top quality. Two Audi tablets, which can be mounted in the backs of the front seats, also use OLED technology. They are extremely thin and slightly curved. The show car offers its driver and passengers superior comfort before the car even begins to move. The “butler” – an innovative, intelligent software program – identifies the passengers as they get in based on their smartphones and adjusts the seats and climate control system according to their preferences. The system also makes suggestions for music and route planning according to the owner’s preferences. The Easy Slot system in the centre console connects the phones with the onboard infotainment system and charges them inductively. The upper section of the instrument panel is finished in Lifestyle Blue, while the lower zone, the seats and the carpeting are Sard Brown. Bezels of open-pored, dark fine-grain ash veneer adorn the wraparound, the doors and the centre tunnel console. Aluminium elements set powerful accents. Natural-looking Unicum leather is in large sections of the instrument panel, on the centre console tunnel and on the seats. Artfully designed perforations in the seat centre lines are evocative of the Singleframe grille bars. A generous band of Alcantara runs from the door inserts over the arm rests to the luggage compartment. 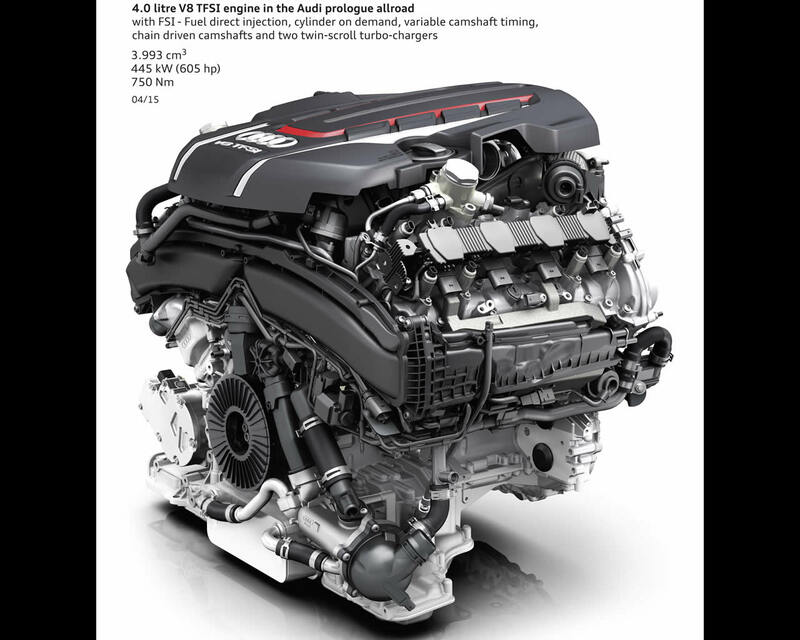 The 4.0 TFSI engine – a V8 with twin turbochargers – and the electric motor integrated into the eight-speed tiptronic produce 734 PS of system power and 900 Nm (663.8 lb-ft) of system torque. The quattro all-wheel drive system utilises the power of the Audi prologue allroad perfectly in every situation. The show car rockets from 0 to 62mph in 3.5 seconds, yet is capable of achieving up to 117mpg according to the NEDC standard for plug-in hybrids, which corresponds to 56 grams CO2 per km. The lithium-ion battery mounted in the rear of the car has a capacity of 14.1 kWh for a purely electric range of 33 miles. 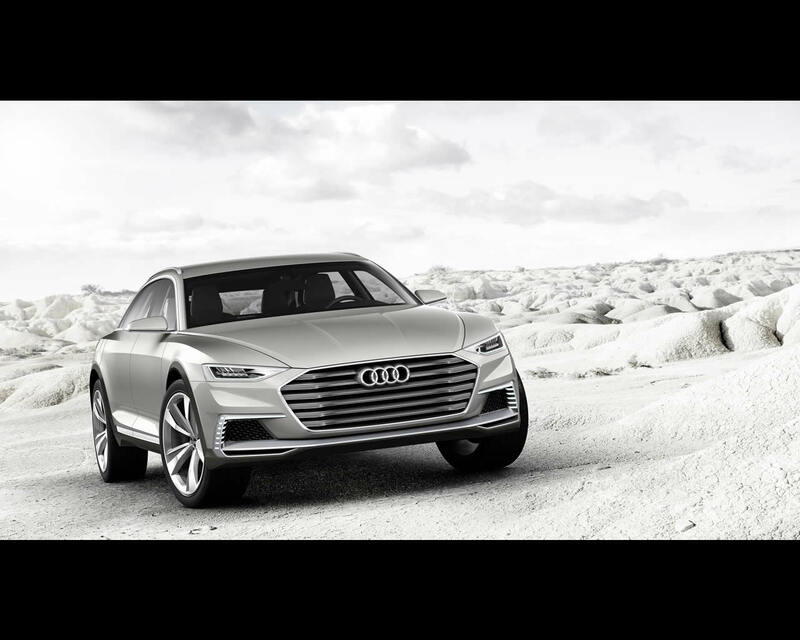 With its AWC (Audi wireless charging) technology which the brand is developing for series production, the Audi prologue allroad can also be charged inductively. 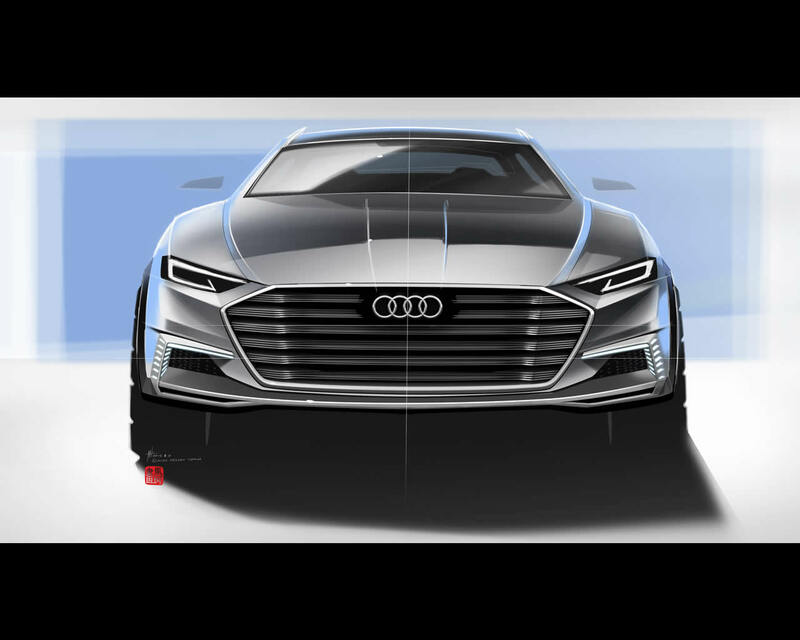 The body of the Audi prologue allroad is 77 mm higher than that of the Audi prologue Avant. The chassis is state-of-the-art. The front and wheel axles are lightweight, five-link constructions. The 20-inch brake discs are made of weight-saving carbon-fibre ceramic. The adaptive air suspension sport – an air suspension system with controlled damping – offers a wide range between extremely comfortable cruising and tight handling. The dynamic all-wheel steering combines a variable-ratio, dynamic steering unit with an additional steering unit for the rear wheels to harmoniously resolve the conflict between dynamic driving and stability.